Asaba [the creator of Kidsbeer] said kids and other people "can raise a glass with this, even if they cannot drink any liquor." 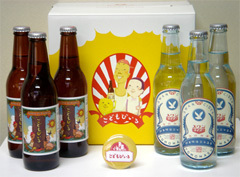 Satoshi Tomoda, president of the beverage maker, said: "Children copy and mimic adults. "If you get this drink ready on such occasions as events and celebrations attended by kids, it would make the occasions even more entertaining." "Even kids cannot stand life unless they have a drink," reads the product's advertising slogan. Is there some massive cultural disconnect that I'm missing here? There has to be, right? "Even kids cannot stand life unless they have a drink"??? Are you kidding me? It sounds like they wrote it in The Onion. The Kidsbeer Shop if you're interested in picking some up (and you read Japanese).